Lab technician Chad Reinke tests samples for the presence of PEDV in the veterinary diagnostic laboratory at Iowa State University. A fast-spreading virus never before seen in the United States hit the pork industry more than two years ago, racking up roughly $1 billion in losses and spiking prices for consumers. While researchers are still trying to track the culprit, it appears to be an intrepid world traveler that may have been delivered directly to farmers’ barn doors, creating an intriguing international back story traced to China. Harvest Public Media spent months examining the outbreak of Porcine Epidemic Diarrhea (PED) and its haphazard, rapid spread across the country. PED doesn’t threaten food safety or human health, but it does jeopardize the food supply. What we have pieced together from interviews and public records shows that PED confounded researchers and industry insiders scrambling to contain it. Even so, the U.S. Department of Agriculture stalled for a year on making reporting the disease mandatory, which could have helped in preventing the devastating spread. Looking back raises questions: Where did the virus originate? How did it get here? And how did it spread? Looking back may also offer lessons to government and industry officials who have battled two highly-infectious and fast-moving viruses in the heart of farm country in just two years, PED and bird flu. Spring 2013. Hundreds of baby pigs were dying off and nobody knew what was making them so sick with diarrhea that they succumbed to dehydration. At the Iowa State University Veterinary Diagnostic Lab, pathologist Greg Stevenson had seen plenty of infections. But genetic testing done that spring was telling him the tissue damage under his microscope was not from one of the usual suspects. He and his colleagues were stumped. “Very quickly we were talking in the hallways and saying, ‘I've had this case, you had that case,’” he said. 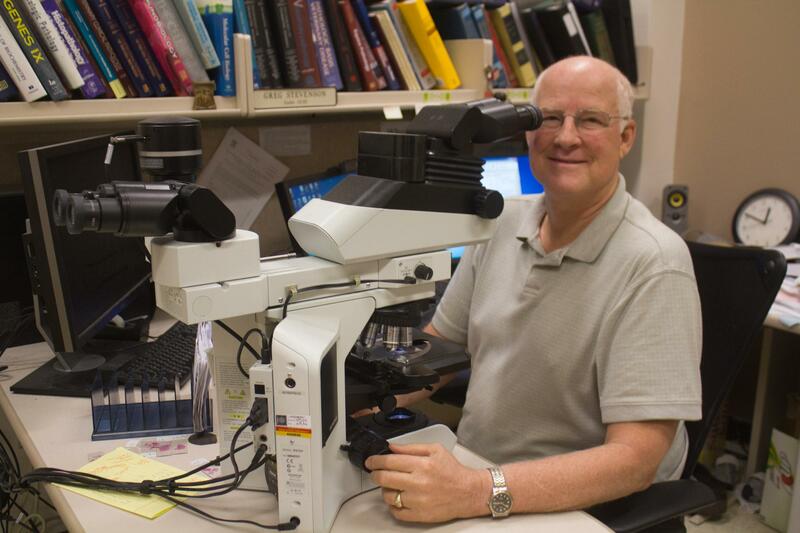 Veterinary pathologist Greg Stevenson and his colleagues at Iowa State University's Veterinary Diagnostic Lab pushed into high gear when the samples they were looking at didn't test positive for familiar U.S. swine diseases. It didn’t take long to recognize that they needed to act fast and work with other labs. It was a chaotic time. They wondered if their molecular test for a known virus was bad, so they asked colleagues at the South Dakota State University Animal Disease Research and Diagnostic Laboratory to run genetic tests to see if they could find any known virus. Scientists there, too, were mystified. One of those guys was Phil Gauger, who oversees molecular testing at the ISU lab. He realized if the old tests weren’t working, something had to give. Whether it was foresight or just luck, another one of “those guys,” virologist Kyoung Jin Yoon, had paid attention when his friends in Korea told him about the deadly PED virus. He contacted them for more information about PED. “At the same time, we [are] always concerned about the emerging of new diseases,” Yoon said. Just for that reason, Yoon’s team had previously prepared themselves for the possibility of needing a PED test. They pulled that work off the shelf, expanded it to a functional test using internationally-shared genetic data, and discovered that sure enough, PED had arrived in the United States. At the peak of the outbreak, Gauger said, the ISU lab ran up to 1,000 PED tests. Even now they still do a couple hundred PED tests daily. So they knew what it was, but the researchers still didn’t know where PED came from, nor how it got here. China seemed the most likely source. 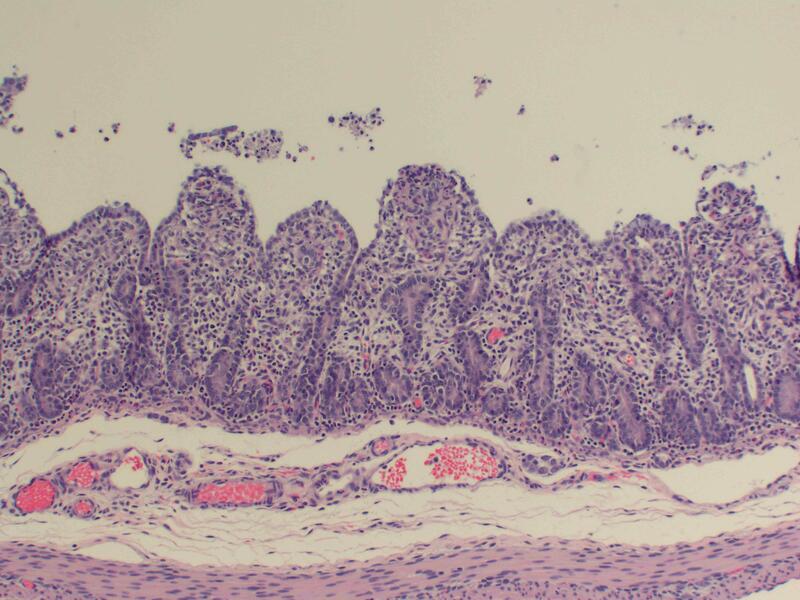 A microscope image of Porcine Epidemic Diarrhea, or PED, taken in the Veterinary Diagnostic Lab at Iowa State University. What they did soon know for certain, though, was that tracking the movement of the virus was as challenging as identifying its origin. It was spreading quickly, hopscotching among farms. August 2013. Farmers in 17 states had battled infections. There was no vaccine to quell the virus and soon researchers and farmers alike would learn that PED thrives in cold weather. December 2013. Farm-to-farm transmission was so poorly understood rumors circulated that people could walk into a convenience store following someone from an infected farm and leave with PED on their boots, thereby spreading it back to their own farms. That proved to be unsubstantiated, but the fact that some swine experts, including one at South Dakota State University Extension, considered the rumor plausible underscored how much veterinarians and scientists were working in the dark. Still, the initial understanding remained that the virus could survive, and be readily moved from one place to another, by hitchhiking on humans, their clothes, trucks, tires, etc. Biosecurity measures such as truck washes and disinfectants for boots sprung up where they hadn’t been and were strengthened where they’d previously existed. But vexingly, many farms that deployed the most advanced biosecurity, notably large hog confinements where showers often were already required upon entering and leaving a barn, became infected. April 2014. Thirty states were infected, with millions of piglets dead — nearly 10 percent of the total U.S. swine herd. The U.S. Department of Agriculture announced it would make reporting of PED cases mandatory. But the ruling didn’t take effect until June, more than a year after PED was first identified in this country. We asked Brian McCluskey, USDA’s executive director for science, technology and analysis services, whether an earlier reporting requirement might have changed the outbreak. Researchers remained stumped about how the virus was moving among farms. But from their work in the field, some swine veterinarians had identified a suspect: farmers could have been directly, albeit unknowingly and unwittingly, giving their animals the virus through feed. January 2015. At the Iowa Pork Congress in Des Moines, Matt Anderson, a northwest Iowa veterinarian, told a session on PED that he accepted the hypothesis that the virus was moving in feed. Since then, other veterinarians have spoken with similar certainty. In 2015, two more states and Puerto Rico have had their first PED cases, bringing the total number of infected states to 35 plus one territory. September 2015. USDA released a report looking at how PED got here. Working after the fact, going back almost a year after PED arrived, USDA relied on lab-testing hypotheses to evaluate how realistic studies were but couldn’t nail down a definitive answer. A flexible intermediate bulk container, a type of woven fabric shipping tote used on cargo ships and trucks. But McCluskey said their best guess was that the virus may have hitched a ride in a flexible intermediate bulk container, a type of woven fabric shipping tote used to send all sorts of things around the world on cargo ships and trucks. December 2015. It seems the virus is here to stay. Fortunately, tools have emerged to combat it. Vaccines are now on the market and are proving potentially profitable. Although terms were not disclosed, Merck Animal Health recently snatched up Harrisvaccines, an Iowa start-up that created the first PED vaccine and received the first conditional license from the USDA to sell it to veterinarians and farmers. Yet more than two and a half years after the virus arrived, PED researchers are still trying to pin down how it got here, because if one sneaky swine disease can cross oceans and borders undetected, that ratchets up the need for better ways to protect animals.